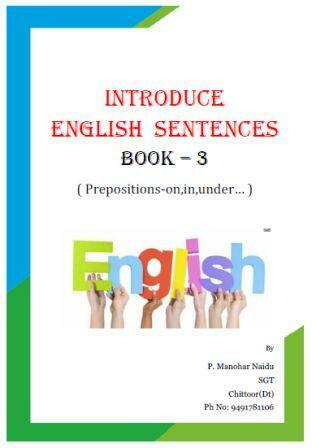 Introduce english sentences(book-3) is compiled by P.Manohar Naidu Sir,Chittoor dist.We also provide Book-1,Book-2 links bellow. ➤Definition:A preposition is a word that shows the relationship between a word in the sentence and the word that is the object of the preposition. Prepositions are short words (on, in, to) that usually stand in front of nouns.One preposition in your native language might have several translations depending on the situation.There are hardly any rules as to when to use which preposition. The only way to learn prepositions is looking them up in a dictionary, reading a lot in English (literature) and learning useful phrases off by heart (study tips).Prepositions "On," "At," and "In" A preposition is a word that links a noun, pronoun, or noun phrase to some other part of the sentence. Prepositions can be tricky for English learners. There is no definite rule or formula for choosing a preposition.